The man who would become Waco’s most famous photographer, Fred A. Gildersleeve, was born near Boulder, Colorado, on June 30, 1880, to Captain Allen Jesse and Sarah Ellen Pew Gildersleeve. His father, Allen Jesse Gildersleeve was a Civil War veteran having served as a Union Army Captain in the Missouri Cavalry, 14, Regiment, Company D, and died in 1881 at the age of 46. After the father’s death the family moved to Kirksville, Missouri, near the mother’s family. There, young Fred attended the Model School (part of the Normal School) graduating at the age of 16. His photography career began at the age of eighteen when he was given a Kodak box camera by his mother. He photographed students at the school and sold them for twenty-five cents each. In 1903, Gildersleeve graduated from the Illinois College of Photography in Effingham, Illinois, and soon after, his career as a professional photographer began. In 1905 Fred Gildersleeve came from Texarkana, Arkansas, to Waco to work in the photography business having had a brief photography career in that city. His sister, Jessie Ellen, arrived in Waco around the same time to work as a doctor of Osteopathy. Their mother, Sarah Gildersleeve later joined them and lived with her daughter. 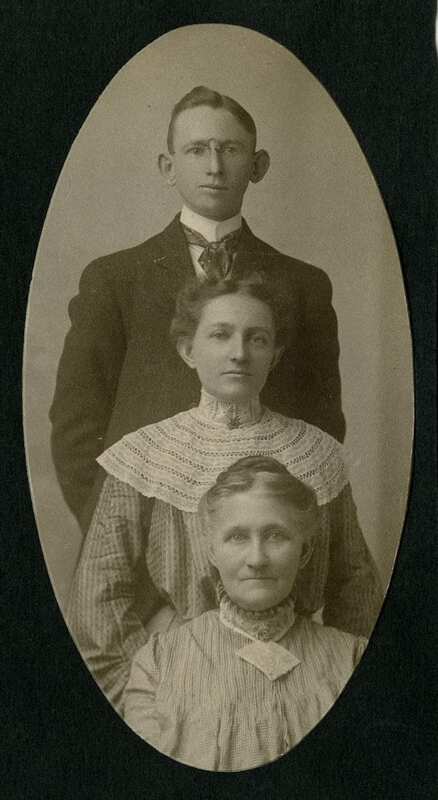 Fred married Florence Jennette Boyd on December 24, 1908, in Texarkana, Arkansas, who then joined him in Waco. They had no children. Each month, we post an update to notify our readers about the latest archival collections to be processed and some highlights of our print materials. These resources are primed for research and are just a sampling of the many resources to be found at The Texas Collection! Clitus Jones papers, 1914-1923 (#1879): The Clitus Jones papers primarily consist of materials related to his experiences in World War I, as an ambulance driver for the American Expeditionary Forces in France. Through correspondence and personal photographs, Jones details his daily life on the front lines and the effects of the war on France and its citizens. If you are interested in learning more about Jones’ life on the front lines during World War I, come visit Moody Memorial Library on the Baylor University campus in mid-January 2017, where selections from Jones’ collection will be featured in an exhibit commemorating the centennial of the United States entering World War I. [Waco] Amicable Life Insurance Company records, circa 1900s-1980s, undated (#3196): Includes photographs and clippings that chronicle the construction of this 22-story building, an icon of Waco since its construction. Eli Clitus and Lilly Sutton Jones papers, 1879-1893 (#2846): The Eli Clitus and Lilly Sutton Jones papers detail the life of a McLennan County farming couple through correspondence, essays, reports, and a diary. William “Bill”Cagle photograph collection, 1950s-1990s, undated (#3857): This collection gives a good look into a U.S. Air Force photographer’s work in the Korean War. The collection also contains images taken by Cagle of the aftermath of the tornado that struck Waco on May 11, 1953. General Scrapbook collection, 1861-1960 (#3991): Contains a variety of scrapbooks with photos from the early 1900s at Baylor University, Civil War Carte de Visite albums, and general photo albums showing many Texas cities and towns and some non-Texas images. [Waco] Daughters of the Republic of Texas: Sterling C. Robertson Chapter records, 1931-1981 (#1961): Documents the activities of the Daughters of the Revolution Sterling C. Robinson chapter records in Waco, Texas. It contains scrapbooks filled with clippings, photographs, and program booklets that detail the activities of the Robinson chapter. George H. Williams papers, 1917-1993 (#3297): The George H. Williams collection contains newspaper and journal articles relating to aeronautics during World War I. Most significantly, however, the collection holds both ground-level and aerial photographs of Waco, Camp MacArthur, Love Field, Rich Field, and Baylor from 1917-1918. Though The Texas Collection is strong in Texas-related holdings, the print collection contains a great number of volumes about other states, particularly the American West. Many of these volumes came to us as part of the Adams-Blakley gift. Enjoy these selections from Wyoming, Nebraska, and Colorado. 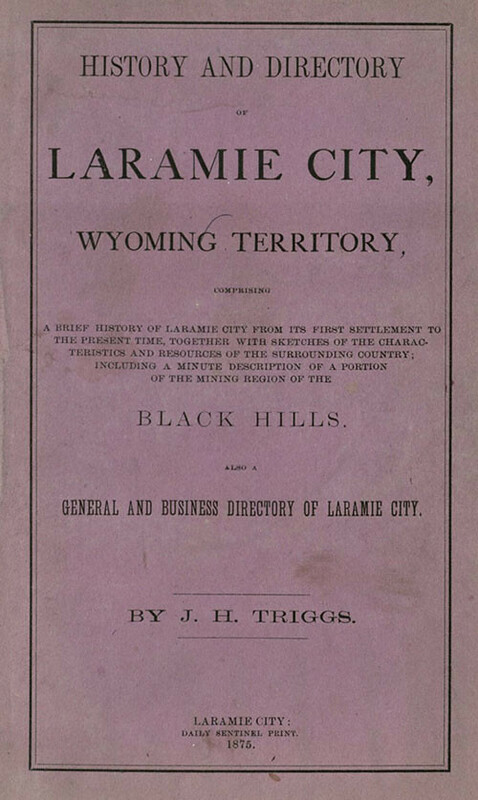 Triggs, J. H. History and Directory of Laramie City, Wyoming Territory. Laramie City: Daily Sentinel Print, 1875. Print. Researchers looking for the names, occupations, and addresses of those who lived in Laramie City in 1875 can find a wealth of information in this volume. Also contained are advertisements for local businesses and information about goods, services, and governance of this newly formed town. Click here to view in BearCat! 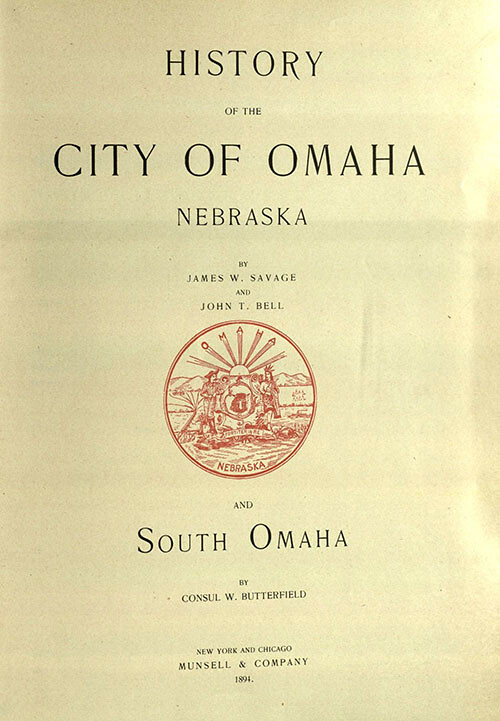 Savage, James W. History of the City of Omaha, Nebraska. New York: Munsell & Co., 1894. Print. This expansive, 700-page volume provides information about Omaha, Nebraska prior to 1894, and includes military history, medicine, hotels, pioneers, churches, etc. Beautiful engravings of the city’s prominent citizens and leaders are included. Click here to view in BearCat! Watrous, Ansel. 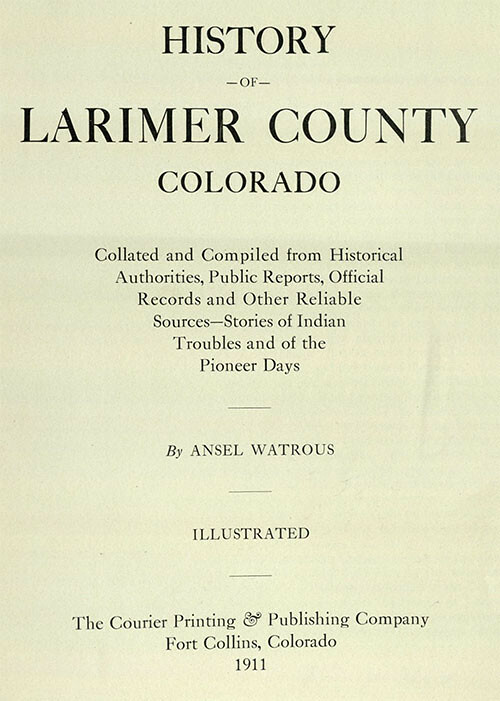 History of Larimer County, Colorado. Fort Collins, CO: Courier Print. & Pub. Co., 1911. Print. More than half of this volume contains biographical sketches of Larimer County pioneers. The rest is filled with historical, political, agricultural, religious information and more. Many photographs and engravings enhance this volume. Click here to view in BearCat! The year was 1918. The United States, under the leadership of President Woodrow Wilson, had struggled to remain neutral in a conflict that had engulfed the European powers and their colonial empires in war. For three years, Wilson successfully navigated his nation on the path of peace, but by 1917 it was painstakingly clear that the United States could not condone the belligerency of Germany. The sinking of passenger liners such as the Lusitania and provocations like the infamous Zimmerman Note had infuriated American officials. On April 6, 1917, Congress declared war against Imperial Germany. An American pilot in training. It is evident throughout Miller’s collection that while learning how to fly, pilots at Rich Field were often trained in aerial photography. Diagrams for how to capture a good landscape photograph are included within these materials. World War I witnessed shocking innovations in the realm of warfare. German U-Boats patrolled beneath the waves of the Atlantic for unsuspecting targets. The Allies and the Central Powers alike shelled their opponents from miles away with debilitating chemicals. Yet perhaps one of the most influential shifts in modern warfare theories arrived on the wings of the airplane. All nations, including the United States, understood that future military victories would require control of the skies. Greaver Lewis Miller was born on July 2, 1897. He enlisted with experience in the “automobile trade.” Here he is seen donning his pilot gear. His shin guards (not pictured) are in excellent shape and can be seen in the collection. Thousands of miles away from the nearest battlefield, in the small town of Cooper, Texas, Greaver Lewis Miller was preparing to fulfill his civic duty. At twenty years old, Miller enlisted with the Army’s Signal Officer’s Reserve Corps with the hopes of becoming a certified pilot. With no prior aviation experience, Miller graduated from the U.S. School of Military Aeronautics at the University of Texas at Austin on July 13, 1918. Armed with the latest aviation theories, Miller put his knowledge to the test at Rich Field. 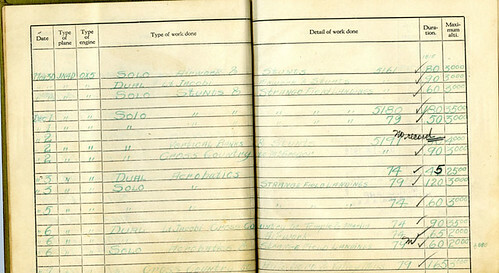 A small sample of Miller’s pilot book that he kept while training at Rich Field. Notice how detailed these records were. (Click on the image to see a larger view.) There were sharp variations in what type of plane was used, what type of exercises were conducted, the duration of the flights, and the maximum altitude reached. 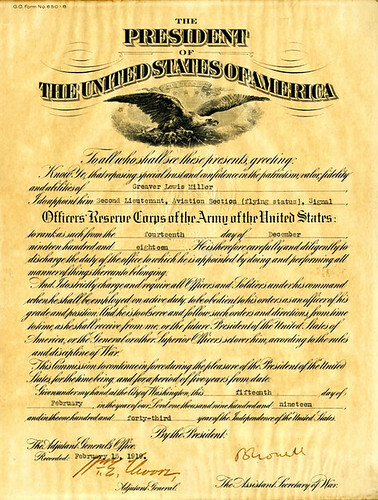 On February 15, 1919, Miller was promoted to the rank of Second Lieutenant. His certificate was signed by the U.S. Adjutant General and the Assistant Secretary of War. In its prime, Rich Field was home to some of the best pilots the U.S. military had to offer. Flying an airplane was an art, and Miller excelled at it. On December 13, 1918, he officially became a “Reserve Military Aviator” by passing the required examinations. While Miller’s papers don’t tell us much about the particulars of his WWI service, we know he continued to impress his superiors—he rose to the rank of Second Lieutenant on February 15, 1919. Like many young boys, Miller had a dream to one day soar through the skies. Thanks to his determination and the opportunities that pilots had during the First World War, Miller’s dream became a reality. He had earned his wings. This is the dream of anyone aspiring to become a pilot. Miller received his wings in 1918. The intricate detail of the feathers and the shield are nothing short of astounding. The Greaver Lewis Miller papers, a small collection of Miller’s personal records, are available for research at The Texas Collection, thanks to the generosity of his son, Jerry. As we prepare to celebrate Independence Day, The Texas Collection thanks Greaver Lewis Miller and all those who have served our country.